M Thorp. An Approach To The Evaluation Of An Elevated Serum Creatinine. The Internet Journal of Internal Medicine. 2004 Volume 5 Number 2. Serum creatinine can be an effective means of assessing renal function. This paper offers an approach to the evaluation of an elevated creatinine that can be undertaken by primary care physicians. An evaluation should begin by excluding potentially surreptitious etiologies of the elevation, including medications and physiologic states. The serum creatinine should then be used to estimate glomerular filtration rate (GFR) using one of the GFR estimation equations. If the GFR is decreased, workup to include history and physical, urinanalysis and renal ultrasound should be preformed. The results of these studies may lead to further workup and/or referral. Serum creatinine is one of the most common assays measured by primary care physicians. Generally correlated with renal function, it offers a rapid, effective test. Knowing what to do with the results of an elevated study is, however, less clear. Few guidelines regarding the appropriate workup or approach to an elevated creatinine are available. The gold standard measurement of kidney function is the glomerular filtration rate (GFR).1 Serum creatinine is a simple and effective means of estimating GFR. Elevations of serum creatinine are thus important within the context of their relationship with GFR, and should be evaluated with this in mind. This paper offers one approach to the evaluation of an elevated serum creatinine. In the steady state, serum creatinine is an ideal marker of glomerular filtration.2The steady state is dependant upon constant generation and excretion, the perturbations of which can affect clinical correlations between serum levels and glomerular filtration. In addition, 5 to 10% of excreted creatinine is secreted in the proximal tubule, rather than being filtered through the glomerulus.3 Changes in secretion can thus affect serum levels without changes in filtration. When evaluating elevated serum creatinine levels, consider first whether recent changes in generation or secretion may have occurred. Some common alterations are listed in Table 1. Use the serum creatinine to estimate GFR. 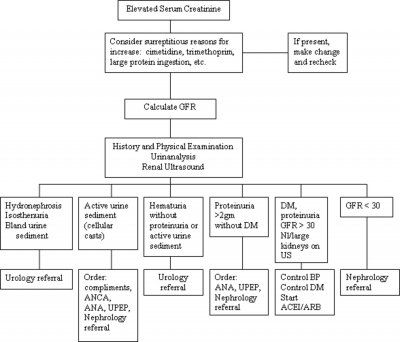 A variety of methods to estimate GFR have been developed. The National Kidney Foundation currently recommends that the estimation equation from the Modification of Diet in Renal Disease study be used, especially when the GFR is less than 60 mL/min/1.73m2,4,5 Other GFR estimation equations tend to overestimate GFR at lower levels, as does creatinine clearance. The MDRD GFR estimation equation is listed on Figure 1. Because of the complexity of the equation, online GFR calculators are available. The NKF website (www.kidney.org) has downloadable calculators for PCs and PDAs. Complete a history and physical, check renal ultrasound and urinalysis. The goals of these tests are twofold: 1) to determine whether renal insufficiency is acute or chronic, and 2) to determine the potential cause. A history and physical examination, combined with an ultrasound and urinanalysis provide an excellent means of initially evaluating potential etiologies of renal disease. A complete history should include questions about drug use (including over-the-counter, prescription and herbal products), edema, nocturia, overt hematuria, elevated blood pressure, family history of kidney disease, diabetes and polyria. Mild renal insufficiency may present with few physical findings, but careful examination for signs of vasculitis, lupus, diabetes, endocarditis and hypertension should be undertaken. Urinanalysis can be helpful in detecting proteinuria, hematuria and an active urinary sediment. Even when the urinanalysis is negative it is helpful, as it suggests the patient may have an extrarenal etiology for the rise in serum creatinine. Proteinuria is usually indicative of glomerular disease. Hematuria may be of glomerular or urological origin. An active urinary sediment (cellular casts) indicates active glomerular disease. If evidence of obstruction or post-renal disease, refer to urology. Patients with obstructive renal disease often present with hydronephrosis on renal ultrasound, isosthenuria (urine specific gravity approximately 1.010), and bland urinary sediment. If hematuria alone is present, consider referral to urology. It is often difficult to discern between an intrarenal and extrarenal etiology for hematuria. Intrarenal hematuria will often present with increased numbers of dysmorphic red blood cells, while extrarenal disease often will not.9 Bladder cancer is a common etiology of hematuria among patients over 50 years of age.10 Ruling this out as a part of working up hematuria is essential. Patients with proteinuria need to be carefully assessed. A variety of means of assessing proteinuria can be undertaken. They include a twenty-four hour urine collection and the protein/creatinine ratio. Patients with significant proteinuria who do not have diabetes should be referred to a nephrologists and UPEP and ANA should be ordered. Active urine sediment should prompt nephrology referral and/or review as it may be indicative of glomerulonephritis. In addition to nephrology referral, physicians should order vasculitis studies (Antineutrophilic cytoplasmic antibody, C3, C4, cryoglubulins, antineutrophilic antibody, etc.) and possibly urine protein electrophersis. Patients with a GFR less than 30 mL/min/1.73m2 should prompt input from nephrology, either in the form of a referral or review. Evaluation of an elevated serum creatinine should begin by excluding potentially surreptitious etiologies of the elevation. The serum creatinine should then be used to estimate GFR using one of the GFR estimation equations. If the GFR is decreased, workup to include history and physical, urinanalysis and renal ultrasound should be preformed. Based upon these studies, further workup and/or referral can be undertaken. 1. K/DOQI clinical practice guidelines for chronic kidney disease: evaluation, classification, and stratification. Kidney Disease Outcome Quality Initiative. Am J Kidney Dis. 39(2):S1-S246. 2002. 2. Bjornsson TD. Use of serum creatinine concentrations to determine renal function. Clin Phamacokinet. 4:200-222. 1979. 3. Walser M. Assessing renal function from creatinine measurements in adults with chronic renal failure. Am J Kidney Dis. 32(1):23-31. 1998. 6. Lin J. Knight EL, Hogan ML, Singh AK. A comparison of prediction equations for estimating glomerular filtration rate in adults with kidney disease. J Am Soc Nephrol. 14:2573-2580. 2003. 7. Cockcroft DW, Gault MH. Prediction of creatinine clearance from serum creatinine. Nephron 16:31-41. 1976. 8. Nishimura M, Terawaki H, Hoshiyama Y, Joh K, Hamaguchi K, Yamada K. Renal ultrasonography is useful in evaluating diabetic renal failure. Clin Nephrol. 59(3):174-9. 2003. 10. Mohammad KS, Bdesha AS, Snell ME, Witherow RO, Coleman DV. Phase contrast microscopic examination of urinary erythrocytes to localize source of bleeding: an overlooked technique? J Clin Pathol. 46(7):642-5. 1993.